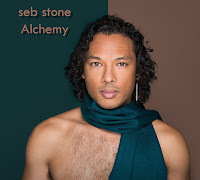 Seb Stone is an Independent Artist/Producer/Engineer, Singer/Songwriter and Multi-Instrumentalist who has recorded a new album at his studio in West London. He was born into an artistic family from Trinidad and England with both his parents having number 1 singles in the 70's (Mac & Katie Kissoon and R & J Stone). Music is very much in his blood though he found his inspiration later then most and has continued a self taught path ever since. His new album 'Alchemy' on which he has written, produced, arranged and performed all aspects whilst bringing in female vocalists Katie Kissoon (George Michael, Van Morrison, Roger Waters) and Anella Kissoon (Sting, Meatloaf) for backing vocals & Trumpet Player Chris Storr (Jools Holland) for a Reggae inspired instrumental track marks a letting go in Sebs artistic expression with honest lyrics and heartfelt songwriting. Tracks on the 10 song album cover a variety of genres from the soul/pop/rock/funk outings of 'My Mind Free', 'Colourblind' and 'Set Myself Freedom' to the roots reggae inspired tracks of 'Two Gun Heaven' and 'Judge Not' to the more folk tinged 'Traveller' and acoustic track 'Hollow', the retro pop flavoured track 'Home' and two piano ballad tracks 'Children of the Sun' and 'Everything'. Taking inspiration from events around the world from the last few years to looking back through human history, spirituality & reflection alongside identity and personal loss, Seb has learnt to express himself with greater depth through his music.